Information for matching chainsaw chains. Explanations of chain types and features. Chainsaw chains vary greatly in size and application. Chainsaw chains are measured in unique ways. Before matching chain types and features, knowing the 3 necessary numbers is most important. Pitch= the distance between 3 links divided by 2. Chains come in 1/4", .325", 3/8", 3/8" low-profile, and .404" pitches. The most common pitch size for chainsaw chains is 3/8". The pitch measurement is often displayed on the saw or in the user manual. When not displayed, it is best to have chain pitch measured professionally. Gauge measures the thickness of the drive links where they affix to the guide bar. Chains come in .043", .050", .058", and .063" gauges. The most common chain gauge is .050". The gauge measurement is often displayed on the saw or in the user manual along with the pitch. Gauge can be accurately measured with calipers when not displayed. Otherwise, gauge should be professionally measured. Number of individual drive links must be counted. No exceptions. Simple length measurements (like "a 2 foot chain) are not helpful for correctly matching chains. Chain length is determined by a combination of distance between links (pitch) and the number of links. 1. Get the pitch measurement. 2. Get the gauge measurement. 2. Narrow Search by Pitch Measurement. 3. Narrow Search by Gauge Measurement. 4. Narrow Search by Number of Links. For each step, the webpage will automatically refresh, showing only compatible chains. "Kickback" occurs when the upper nose of the guide bar touches a material during operation. 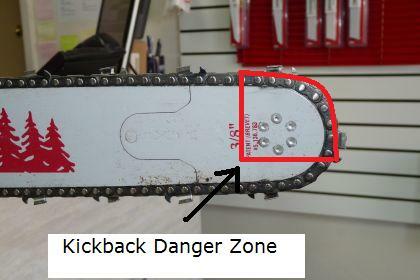 Kickback is one of the most common causes of chainsaw-related injury. 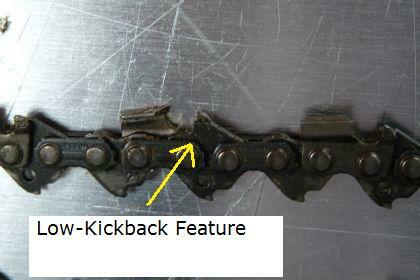 Low-kickback chains reduce the potential for kickback. Unless specially trained, users should always use anti-kickback chainsaw chains. These chains skip one link between cutting teeth for more aggressive cutting. 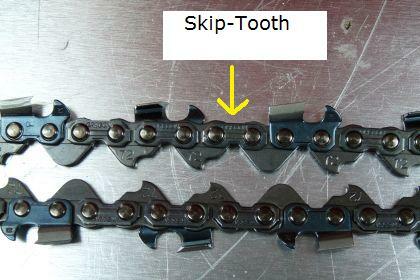 Skip-tooth chains are for professional applications only and require training. These chains skip two links between cutting teeth for very aggressive cutting. Full-skip chains are for professional applications only and require training. Special design to maintain proper lubrication during and between saw operation. This feature files chain teeth as they turn around the guide bar. Chronic tool vibration can cause painful health concerns in the hands. Low-vibration chains reduce the risk of this kind of gradual injury. These are for a specialized kind of cutting only. Ripping chains are generally for professional use only. Carbide chains are hard and durable, but brittle. These chains are for conditions that would cause heavy wear to normal chains. Increased durability in carbide chains comes as a trade-off for sharpness and cutting speed. Please see our article, "Chainsaw Kickback and Safety Guidelines." This article explains exactly what numbers and measurements are needed when matching chainsaw chains, and it also explains how to find them. In addition, this article also offers information about chainsaw chain types and features. Chainsaw chains are available in almost limitless combinations of sizes, types, and features. This is because chainsaws themselves also vary greatly in size and application. 3. the number of drive links (yes, they must be counted) The following is a complete explanation of how these qualities are measured on chainsaw chains, what the most common measurements are, how to find these measurements, and how to measure them when they cannot be found. 1. Pitch Measurement The pitch of a chainsaw chain is a measurement that describes how close together links are on the chain. It does not tell you how many links are present, or what the overall length of the chain is. 1/4", .325", 3/8", 3/8" low-profile, and .404". 3/8" pitch chains are the most common pitch size, and 3/8" low-profile pitch chains are even more common than regular 3/8" chains. 3/8" low-profile chains displace a smaller amount of the material being cut, because their "kerf" (the width of material removed in cutting) is more narrow, reducing the power needed for cutting. 3/8" low-profile chains typically fit chainsaws whose guide bars are 18" or shorter in length, which are the majority of medium-use, non-professional application chainsaws such as a homeowner might own. .404" pitch chains are normally for larger, professional-grade chainsaws often used by the likes of firemen and rescue workers. The greater distance between links makes for more aggressive cutting. When a chainsaw chain's pitch measurement is displayed on the tool, it is usually on the guide bar, towards the user-end of the tool. Sometimes the measurement is displayed very clearly, and sometimes it is mixed in with a bunch of other numbers, so you have to know what to look for. When a pitch number can't be found on the tool or in the user manual, pitch can be measured, but because a high level of accuracy is needed to tell the difference between .325" and 3/8", for example, it is often a better idea to take the saw to a shop to be measured. 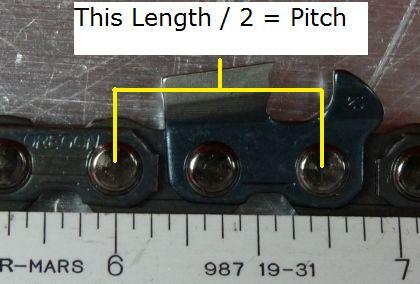 If you decide to measure the pitch yourself, just remember to measure between the middle points of 3 rivets on the chain, and then divide the number by 2. So, for a 3/8" pitch chain, the measurement between three links would be 3/4" (.75"), which is 3/8" (.375") when divided by 2. [Back to top] 2. Gauge Measurement The parts of chainsaw chains that fit into the saw's guide bar are called the drive links. 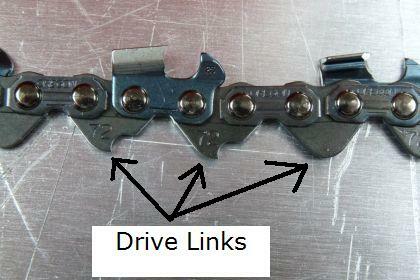 The drive link is the bottom part of the chainsaw chain (see picture below). 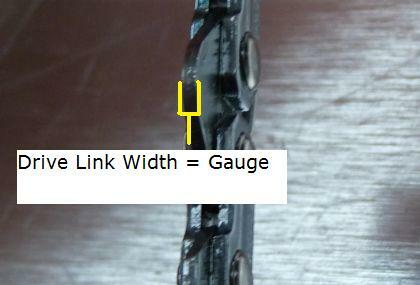 Gauge measures the thickness of the drive links if you were to look at them along the length of the chain. .043", .050", .058", and .063". .050" is the most common gauge. Like the pitch measurement, the gauge measurement is often displayed on the chainsaw, usually towards the user-end of the guide bar. Also like the pitch measurement, the gauge measurement can either be displayed clearly or jumbled in with a bunch of other numbers, so it's important to have an idea of what kind of numbers to look for. Because gauge measurements are so small, it is not recommended that users measure gauge themselves if the measurement can't be found on the tool or in the user manual. However, if a pair of accurate calipers are available, measuring gauge is a cinch. Without calipers, we recommend taking the saw to a shop to have the chain gauge measured (some toolmen are so familiar with these chains that they will be able to identify its measurements by sight). [Back to top] 3. Number of Drive Links To get the right chainsaw chain, the number of drive links on the chain must be counted if the count is not already known. Overall length measurements of chainsaw chains (such as "a 2 foot chain" etc.) are not helpful for finding the right chainsaw chain. This is because the overall length of chainsaw chains is determined by a combination of pitch (distance between links) and the number of drive links. This is the most accurate way for chain manufacturers to keep all the different sizes and types of chains in order. The number of links on a chain is normally not displayed on the tool like pitch and gauge, or listed in the manual. This is why the links must be counted. [Back to top] Chain-Matching Search Steps The following are steps that should be taken before beginning a search for a matching chainsaw chain. 1. Get the pitch measurement of the chain either by finding it on the tool, in the user manual, or dividing the distance between 3 links by 2 (recommended that this be done by a shop). 2. Get the gauge measurement of the chain either by finding it on the tool, in the user manual, or by measuring the thickness of the chain's drive links with very accurate calipers. 3. Count the number of individual drive links in the chain. No exceptions. Now for the good news: the rest is easy. If you have those three numbers, matching the right replacement chain only takes a moment. Below are steps for using these 3 numbers with eReplacementParts.com's easy search filter features on our "Chainsaw Chains" page. All you have to do is click the correct measurements and number of links on the page, and it will automatically filter the search results to display only the chains that match those measurements. 1. Navigate to the "Chainsaw Chains" Page on eReplacementParts.com. This page will display all of the nearly two hundred chainsaw chains that we currently carry, before the search results are narrowed that is. 2. Narrow Search Results by Pitch Measurement. To narrow the search results to list only chains whose pitch number match the chain you're looking for, simply click the correct pitch measurement in the "Narrow Listings By:" box. When you do, the page will automatically refresh and display only the chains that match the selected pitch. So, for example, if I were to click the "[3/8"]" button next to where it says "Pitch:", the page will only display chains with a 3/8" pitch when it automatically refreshes. Also, after narrowing down the results by clicking a measurement, the click-able buttons for that measurement category will disappear when the page refreshes, since that chain quality has already been determined. So, after clicking the "[3/8"]" pitch measurement button, all of the "Pitch:" measurement buttons will disappear when the page refreshes. In the "Narrow Listings By:" box, select the correct gauge measurement by clicking the correct button as described in Step 2. This will further narrow the search results to only chains that match both the previously-selected pitch measurement and the recently-selected gauge measurement. Just as described above, the page will automatically refresh after making the new selection, displaying narrower search results and removing the "Gauge:" measurement buttons now that the measurement has been determined. 4. Narrow Search Results by Number of Links. This is where having counted the number of links comes in handy. Now that pitch and gauge have been narrowed down, select the correct number of links counted on your chainsaw in the "Narrow Listings By:" box by clicking the correct link number button next to the "Drive Links:" section. This will automatically refresh the page and display only the chains that match the selected pitch, gauge, and number of links. Most chainsaw chains have low-kickback or anti-kickback features that reduce the risk of kickback-related accidents. Kickback is what happens when the upper nose of the chainsaw guide bar makes contact with a material during operation. This part of the chainsaw guide bar is referred to as the "Kickback Danger Zone," because, if it makes contact with a material during operation, the increased force of resistance will instantly throw the chainsaw back in the direction of the user (yikes). Kickback-related accidents are often gruesome. "NOTE: While any chainsaw chains can kick back, many of our chain saw chains lack kickback protection and are made for professional users only. If you have not received specialized training for kickback control and prevention, you should only purchase "Low Kickback" chains to help prevent injury." This is actually pretty universal advice. A chainsaw user should have special training if using a chainsaw chain that lacks anti-kickback features. For more about Chainsaw Kickback and Safety--Click here. Because low-kickback chains often limit the amount of material being cut, the cutting goes a little slower than with more aggressive chains, however, low-kickback chains require less power for cutting, because they often have narrow kerfs. It might also be useful to point out that most chain manufacturers have their own trademarked names for low-kickback feature designs available for their chains. Skip-tooth chains space one link between cutting teeth. This allows for lower-resistance, faster, grittier cutting. If a chain is not listed as low-kickback, full-skip, or as having some other special function or feature, it is most likely a regular, skip-tooth chain for professional applications. Full-skip chains space two links between cutting teeth, providing very low-resistance cutting. These chains are typically for saws with guide bars of 24" or longer. When trained to correctly use chains and saws of this length and cutting aggression, users often appreciate the extra length because they don't have to bend down as much to reach the work area. However, these chains are for trained, professional use, and the majority of chainsaw users will not have an application that calls for this type of chain. [Back to top] Other Chainsaw Chain Features There are also a number of chainsaw chain features offered for many sizes and types of chains. These features often have catchy, trademarked names given by the manufacturers who design them, but we will just list them here generically by what they do. Manufacturers have several different design features that help to keep chains lubricated both during and between operation. These are usually grooves and/or holes in the cutting teeth or links that help lubricant stay on the chain. Proper lubrication is naturally very important to a moving cutting tool like a chainsaw, so users may want to consider this feature if maintaining proper lubrication through conventional means sounds like a hassle. 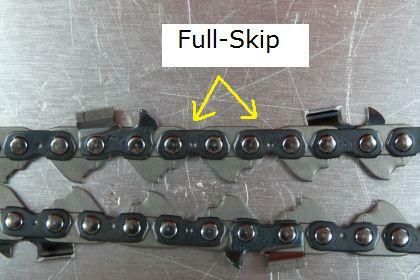 Self-sharpening chainsaw chains have design features that keep teeth filed as the chain passes around the guide bar. Sharpening is probably the biggest maintenance hassle that chainsaw users face, and is usually best done by a shop. 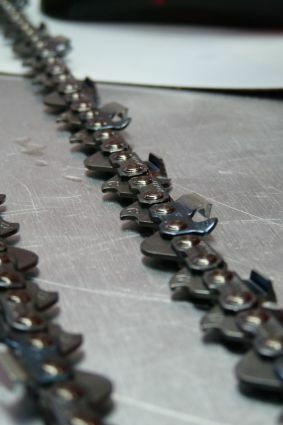 Using a self-sharpening chain can help space those trips to the chainsaw shop further apart. This feature does not always sharpen the chain completely evenly. Because of this, the teeth occasionally need to be touched up manually and eventually will need to receive regular sharpening maintenance. But self-sharpening chain features will keep the chain sharper longer overall. In response to this concern, many chain manufacturers include design features that can greatly reduce saw vibration. This is usually accomplished by creating a space between the chain and the guide bar that acts as a buffer against friction and, therefore, vibration. Users should not be too concerned about chainsaw vibration if the saw sees only occasional use, but if using the saw is part of one's daily routine, a low-vibration chain becomes very important. Users searching through chain types might run into these. Ripping chains are for a very specialized, professional application that involves cutting lengths of wood along the grain. Using these chains requires extra skill and technique, so users will know it if they need one. Users of chainsaws for normal applications never have a need for ripping chains. Carbide is a kind of extremely hard and durable material, although it is quite brittle and can shatter when struck with force. Chainsaw chains made with carbide are designed to be more durable in environments that would quickly wear a normal chain out until useless. Carbide chains can be very expensive, so they are normally only considered for uses where sand, cold weather, dirt, or other rough conditions would cause unusual wear to a chain. Conclusion For being just one kind of power tool accessory, there is a lot to get straight about chainsaw chains. Their unique systems of measurement require a little familiarity with terms and other technical things, but once those three magic numbers are jotted down, you're in the clear. If you're looking to get a new chain for your chainsaw, our Chainsaw Chains page is the place to start. With the information in this article, you're ready to use those search filtering features and narrow down the chain you're looking for with just a few clicks. Clicking around on our Chainsaw Chains page is also a great way to get more familiar with chain sizes and types, even if there's still some time before your next chainsaw chain replacement. [Back to top] What we're about.